THE ROUNDED END OF THE BENCH ALLOWS FOR EASIER AND MORE COMFORTABLE TRANSFER FROM THE WHEELCHAIR TO THE SHOWER. LEGS ARE MADE OF STURDY, RUSTPROOF ALUMINUM WITH WIDE FOOT GRIPS TO STABILIZE AND SECURE THE BENCH. THE TRANSFER BENCH IS MADE OF DURABLE, EASY TO CLEAN PLASTIC IN AN ATTRACTIVE WHITE COLOR. 250 LBS WEIGHT CAPACITY. 24" X 15" SEAT OFFERS EASY TRANSFER FROM WHEELCHAIR TO BATH SEAT. 5 LEVELS OF SEAT HEIGHT ADJUSTMENT, EACH INCREMENT IS 1". SEAT HEIGHT ADJUSTS FROM 16 1/2" TO 20 1/2". SEAT BACK CAN BE ASSEMBLED FOR LEFT OR RIGHT HAND APPLICATIONS. INSTALLATION OF BACKREST IS OPTIONAL. SURE-GRIP LEGS PROVIDE ADDED SAFETY AND STABILITY. THE OVERALL DIMENSION IS APPROXIMATELY 29"(L) X 16"(D) X 25"(H, WITHOUT BACKREST). 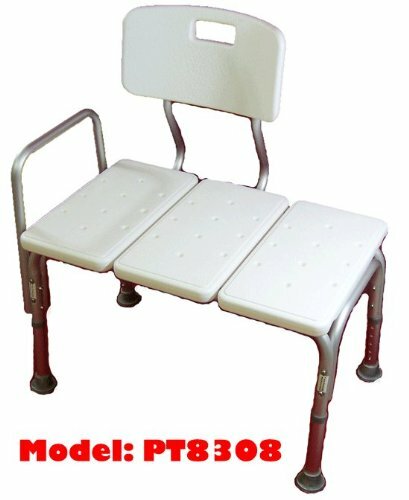 24" X 15" SEAT OFFERS EASY TRANSFER FROM WHEELCHAIR TO BATH SEAT. 5 LEVELS OF SEAT HEIGHT ADJUSTMENT, EACH INCREMENT IS 1". HIGHLY FLEXIBLE, SEAT HEIGHT ADJUSTS FROM 16 1/2" TO 20 1/2". SEAT BACK CAN BE ASSEMBLED FOR LEFT OR RIGHT HAND APPLICATIONS. INSTALLATION OF BACKREST IS OPTIONAL. SURE-GRIP LEGS PROVIDE ADDED SAFETY AND STABILITY. THE OVERALL DIMENSION IS APPROXIMATELY 29"(L) X 16"(D) X 25"(H, WITHOUT BACKREST).